Every once in a while, a title comes along that is so fundamentally outstanding that it starts making people think about video games as works of art instead of just pleasant diversions. 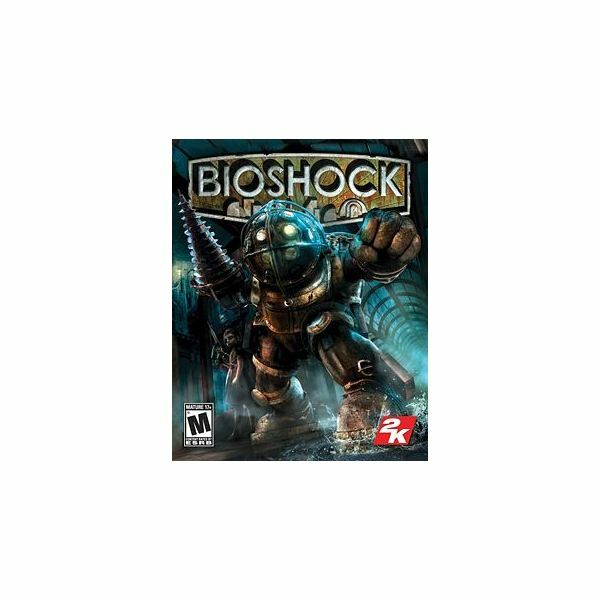 BioShock, a first-person shooter developed and published by 2K Games and originally released for the Xbox 360 in August 2007, is one such game. The game hits high notes on all of the technical aspects, as it looks beautiful and is immensely fun to play. However, it is the deep and thought-provoking plot that truly makes this epic stand out from the crowd, earning it immense critical praise as well as several Game of the Year awards in the process. BioShock weaves such an intricate tale that it is difficult to discuss in brief. Essentially, the game begins with the player as a passenger on a plane that suddenly goes down. After coming to in the middle of an ocean, he swims for land and eventually comes across a bathysphere station. With no other recourse, he takes the bathysphere down, and comes across a fallen utopia that goes by the name of Rapture. Rapture was supposed to be the ultimate utopia, but obviously something went wrong, as various creatures and monstrosities now roam the streets. With the assistance of a man named Atlas, the player begins to navigate the ruins of this supposed paradise. Along the way, the main character discovers several dark secrets, not just about this underwater world but about himself as well. Meanwhile, the player will also be faced with several difficult moral choices along the way, particularly when it comes to choosing between the desire for power and the sanctity of human life. These decisions have an impact on the game’s ultimate outcome. It may be difficult to tell from this brief review, but BioShock is a powerful, powerful video game, thanks largely to the exceptional writing. It has the best plot of any FPS by far, and while it may sound like hyperbole, the truth is that it sets the bar so high that we may never see it’s equal. Video games are above all a visual medium, and the top-notch script would’ve all been for naught had the developers dropped the ball on the rest of the sensory experience. Thankfully, that didn’t happen, as BioShock is an aesthetic masterpiece as well. The environments have been crafted with amazing detail, the characters are expertly animated, and every person and item in the game responds with textbook ragdoll physics, resulting in amazing realism. Enhancing that realism is the true-to-life sound effects, the excellent voice acting and the creepy soundtrack. The music is particularly noteworthy, because in order to make Rapture truly feel like a failed community from the 1960s, it is packed with old-school songs such as "Beyond the Sea". Without a doubt, it is unspeakably eerie to walk into a room and hear one of these tunes playing, knowing that there’s quite possibly an ambush awaiting you. BioShock is a game in which the developers were clearly focusing on establishing a certain mood with the graphics, music and sound effects, and without a doubt, they nailed it. If there’s one area where BioShock has drawn some complaints, it is in the gameplay department. Essentially, the game plays just like the typical first person shooter, and the controls are very tight. Plus, players can find and earn special powers and abilities, genetic alterations referred to by the game as ADAM. These powers can be leveled up at specific locations in the game, as can the multitude of different weapons that gamers will come across. These can be great fun, as gamers can use different combinations of weapons and ADAM powers to set up traps for the enemies that pursue them, combating them in fresh and creative ways. Sounds good so far, right? Well, for the most part, BioShock is an immensely fun game to play. The main issues that some folks have with it, especially more experienced FPS gamers, is that the game lacks challenge and has no multiplayer modes. Players can choose different difficulty levels, but for the most part, there is really no penalty for dying, as the character will simply respawn at a different location. This minor complain prevents me from giving BioShock a five star score, but in reality only a select few gamers will be bothered by this forgiving approach to failure, and it really does not detract from the intensity of most in-game battles anyway. Multiplayer is a bigger omission, but considering the developers wanted to approach things a little differently and focus on developing an exceptional single-player experience, it is eminently forgivable. As someone who is by no means a fan of first-person shooters, I was blown away by just how much I absolutely loved BioShock. The controls are spot-on, the sound and graphics are completely immersive, and the story (which 2K Creative Director Ken Levine admits was heavily influenced by the works of Ayn Rand and George Orwell) is simply, for lack of a better word, epic. Many of you are probably still skeptical. You’ve probably read this and heard all of the hype for this game throughout the gaming media, and are still not convinced a game could really be that good. I know, because I felt the same way at first. Then I downloaded and played the demo, and there was no turning back. Is BioShock really as good as everyone says it is? Yes. Yes it is.